I made a few sample albums now just to test how the skin works from the user’s perspective. This little excercise was also beneficial to face everyday problems – you might stumble upon as a user – and fix numerous bugs in the process. Finally I put up four different albums with different looks to show off how flexibly Tiger albums can be customized. I’m not sure if this is widely known, but jAlbum saves the settings along with the uploaded albums (unless you opt out), which makes it possible for other people to copy the look of the album. Naturally, only the public details – like colors or layout – not the sensitive data, like Facebook App ID, or your email address. Use the File → Import → Settings from Published album and copy/paste the album’s URL. 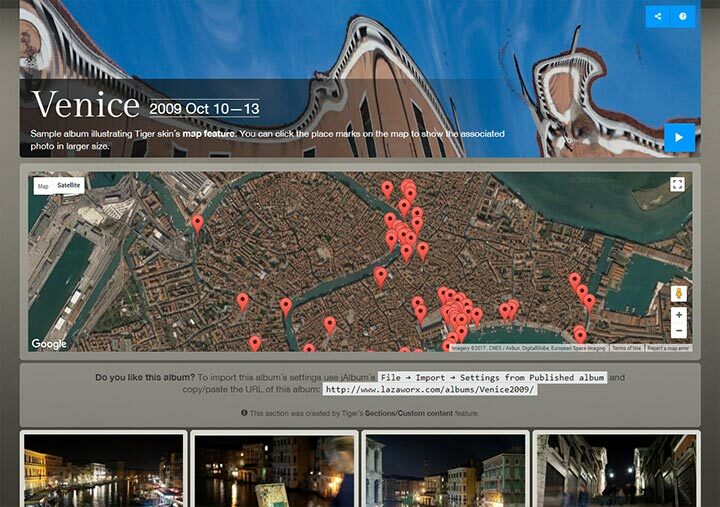 Perhaps showcasing travel photos is the most frequent use of jAlbum. When I travel, I prefer showing off my photos in a low-key, elegant way, with emphasis on the photos themselves. Besides using folders based on years / locations, I use keywords to label places. This makes it easier later collecting images made at the same place or made along the same concept (e.g. panoramic photos). I used Tiger’s default style (Linen) and modified just a few things. This album has more than 1 600 photos, which took some 15 minutes to make on the first run, but subsequent makes took only ~25 seconds. Pretty quick, isn’t it? We have streamlined both jAlbum and the skin to process large albums as fast as possible. Initially, jAlbum has to go through all files to gather camera dates, but this information is now cached, speeding up future album builds considerably. Previously this process could take 10 times longer. Adding video files in a Tiger album hasn’t been a problem since the beginning, but lately the so-called “External content” feature has been added too. Through this you can add just ANY content you want (instead of the original picture): custom HTML code, an external website, or embed a YouTube/Vimeo video. You name it. This content then shows up in the lightbox ebedded through a window. You can even use jAlbum variables in the code. If you’re curious, you can read how this album was made. The album also demonstrates an unusal way of using face tags. 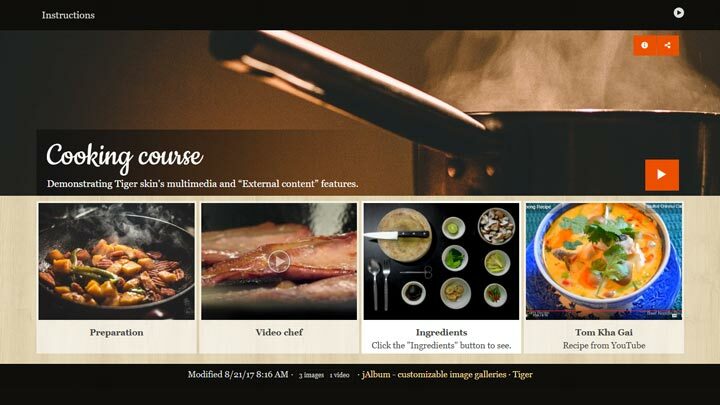 This PayPal-based shopping cart component of Tiger has appeared first in our Photoblogger skin. This collects the chosen items locally and allows the customers to edit (change options, quantities, etc.) before they send it to PayPal. Previously, Turtle skin had two different types of shopping carts: one that sent items to PayPal right off upon clicking the button in the lightbox, the other made it possible to select more items but only on the index page, and all had to have the same price (and same other options). This was probably hard to follow for the visitors. Check out how the new shopping cart works! Did you know your visitors don’t have to sign up with PayPal? Besides using their PayPal balance, they can pay the usual way with their credit card too. If you want to have a custom content above the page – like here – simply use the Settings → Tiger → Header → Custom content feature. This way you can easily add your site’s logo and/or your site navigation instead of the ugly, user experience killer “IFRAME” method. Similarly, look for the Settings → Tiger → Footer → Custom content box for adding your custom page footer content. Tell us what you think, your comments are welcome. Si alguien pudiera asesorarme estaría dispuesto a pagar el servicio claro. jGromit: this could happen if the browser is identified as touch-driven. Are you on a surface-like PC? Für Deutschland wäre es schön gewesen andere Bezahlarten mit anbieten zu können. Zum Beispiel für Firmen auf Rechnung oder Überweisung. Ansonsten wieder sehr schick. usw. 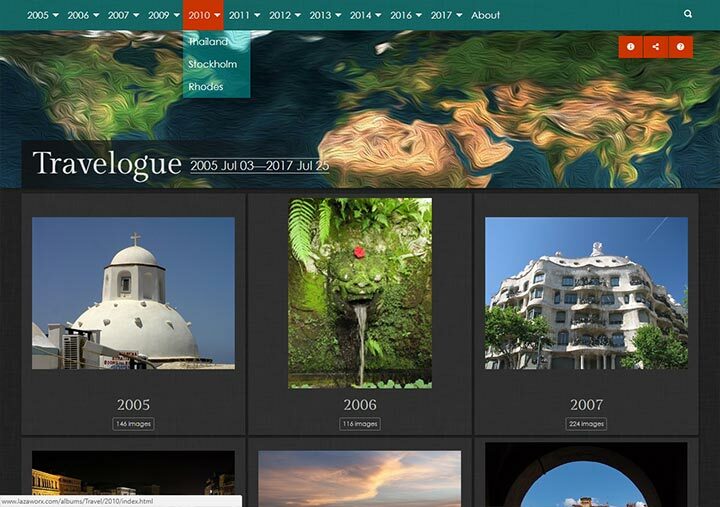 When I view the first (Travel) album, I get the main page with the Travelog heading and a frame for each year, however the squares are all blank except for the year and number of fotos, and clicking on the square does not take me to an image. I tried both Internet Explorer & Microsoft Edge. It works in Google Chrome. The other 3 sample albums seem to work fine. I am using the latest update of Windows 10. On the "Video chef" page, in both Chrome and Firefox, after starting the video, the control bar doesn't reappear on mouseover. You actually have to click on the video to get the controls to reappear. I don't know whether that's intentional or not, but it strikes me as nonstandard behavior for a video.